Doug Aitken is interested in blurring lines. Throughout his work, the American artist and filmmaker has blended different forms, themes, disciplines and viewing experiences, ousting ideas of fixed roles, or notions, instead revelling in the multifarious – often limitless – free-form. In 2012, he coined the term ‘liquid architecture’ for Altered Earth, a multimedia instillation that coalesced art, sound and landscape in its construction of a hazy, interactive labyrinth; similarly, Station to Station saw Aitken literally take to the rails in 2013 as he filled nine vintage train cars with art and music and journeyed them over 4000 miles across America, creating different ‘happenings’ at each stop. The entire project resulted in an eponymous film (made up of 62 individual one-minute shorts) for good measure, too. For his latest project, the Redondo Beach-born polymath has created The Garden, a living, breathing, interactive artwork that traverses the disjunction between the modern, man-made experience and the natural world in typically amalgamated fashion. Set inside a huge warehouse, viewers are invited to enter a glass chamber surrounded by a thick, green jungle, in which they are given ten minutes – and a baton – to do with what they will. 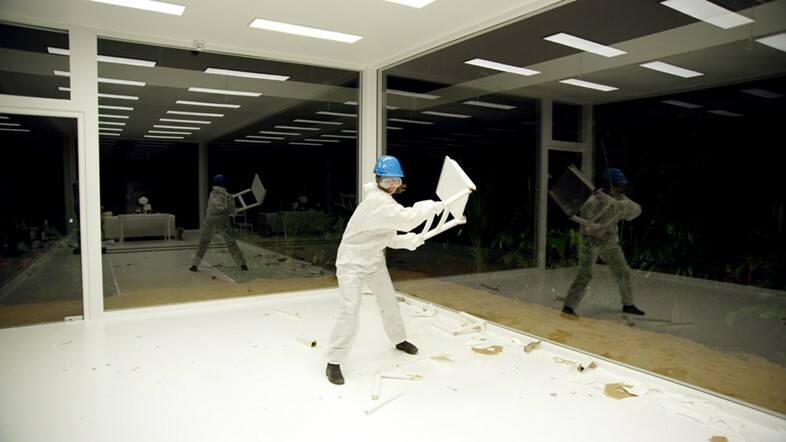 It tends to result in a lot of stuff – tables, chairs, lights, sometimes a cabinet – getting smashed to pieces, as the spectator becomes an active, inherent part of the artwork itself, with the process recorded and streamed live for those watching from their screens. With The Garden currently running as part of the Aros Triennial, we spoke with Aitken about breaking barriers, transformation and why now is the perfect time to confront the tension between our natural and artificial worlds. In your own words, tell us about The Garden and why you decided to begin the project. Doug Aitken: I'm interested in artworks that create systems – artworks that disrupt or challenge the locations that they inhabit. I think in a project like The Garden, I wanted something that had more friction and agitation. I wasn't so much interested in working with the harmony of nature in the landscape, but instead with the contrast between viewing the landscape as something which can be tamed and refined versus a place that is wild, dangerous, and desperate for survival. Since The Garden opened, what kind of reactions have you seen from participants – have any particularly surprised you? Have they all opted for destruction? Doug Aitken: I’ve been surprised by the degree of release that we see happening inside the Garden. Each viewer goes in for maximum of ten minutes, and within that time they do whatever they want. The people I've spoken to after they have come out talk about a sense of complete freedom and living in the present. The reactions can be so surprising. Is challenging the notion of artwork as fixed and static something you’ve always been interested in? Doug Aitken: I'm interested in breaking the barrier between the viewer and the content of the artwork. Trying to find ways to create less of a separation. I want the viewer to own the experience of artwork, to consume it and to make it become part of themselves. I'm not interested in fixed meanings but instead the questions that are raised by the experiences. The tranquillity of the jungle seems to deliberately juxtapose what happens inside the chamber. Is this contrast something you were always interested in playing with? Doug Aitken: There is a tension between the natural and artificial worlds. 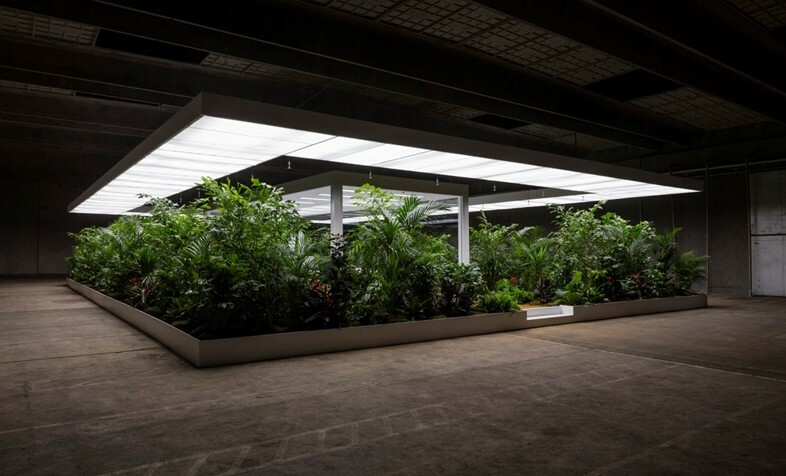 One is confronted by a dense jungle, a living, breathing environment, growing in the darkness of an industrial warehouse under artificial LED lights on a minimalistic man-made stage. There’s a sense that we’re watching something that is forbidden as the viewer both watches and performs. The viewer inside the installation is under the eye of the viewer outside of the artwork. Are we as humans more disconnected from nature and the environment than ever before? Doug Aitken: This is an incredible moment in human history, we are moving outside of being contained in our bodies, communicating in new ways, and becoming de-material. The way we relate to the natural landscape is different than it has been in the past. The faster we move the more we glean information on a rapid surface level. In The Garden, when you're alone in silence in this glass room it is startling how quiet it is, you look around and you find yourself in the present with very little distraction. I think that idea of the present is often what we lack. What role does the live stream play in terms of the artwork’s process? Doug Aitken: This is a living artwork, one that changes continuously with every viewer, every minute, every day, it will transform. The live stream is one way to be able to watch this transformation. I’ve read that you’re interested in the notion of entropy. Do you feel that social disorder is an inevitability of the modern condition? Doug Aitken: With The Garden I wanted the viewer to perform and to release.